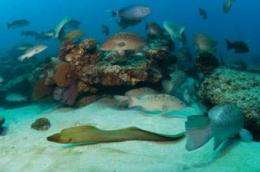 Results of a 10-year analysis of Cabo Pulmo National Park (CPNP), published in the Public Library of Science (PLoS) ONE journal, revealed that the total amount of fish in the reserve ecosystem (the "biomass") boomed more than 460 percent from 1999 to 2009. Citizens living around Cabo Pulmo, previously depleted by fishing, established the park in 1995 and have strictly enforced its "no take" restrictions. "The study's results are surprising in several ways," said Octavio Aburto-Oropeza, a Scripps postdoctoral researcher, World Wildlife Fund Kathryn Fuller fellow and lead author of the study. 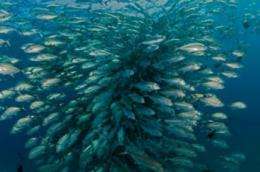 "A biomass increase of 463 percent in a reserve as large as Cabo Pulmo (71 square kilometers) represents tons of new fish produced every year. No other marine reserve in the world has shown such a fish recovery." The paper notes that factors such as the protection of spawning areas for large predators have been key to the reserve's robustness. Most importantly, local enforcement, led by the determined action of a few families, has been a major factor in the park's success. Boat captains, dive masters and other locals work to enforce the park's regulations and share surveillance, fauna protection and ocean cleanliness efforts. Strictly enforced marine reserves have been proven to help reduce local poverty and increase economic benefits, the researchers say. Cabo Pulmo's marine life recovery has spawned eco-tourism businesses, including coral reef diving and kayaking, making it a model for areas depleted by fishing in the Gulf of California and elsewhere. "The reefs are full of hard corals and sea fans, creating an amazing habitat for lobsters, octopuses, rays and small fish," said Brad Erisman, a Scripps postdoctoral researcher and co-author of the article. "During some seasons thousands of mobula rays congregate inside the park and swim above the reef in a magnificent way." In the ten years studied, the researchers found that Cabo Pulmo's fish species richness blossomed into a biodiversity "hot spot." Animals such as tiger sharks, bull sharks and black tip reef sharks increased significantly. Scientists continue to find evidence that such top predators keep coral reefs healthy (link to Sandin news release). Other large fish at Cabo Pulmo include gulf groupers, dog snappers and leopard groupers. "Few policymakers around the world are aware that fish size and abundance can increase inside marine reserves to extraordinary levels within a decade after protection is established; fewer still know that these increases often translate into economic benefits for coastal communities" said Aburto-Oropeza. "Therefore, showing what's happened in Cabo Pulmo will contribute to ongoing conservation efforts in the marine environment and recovery of local coastal economies."